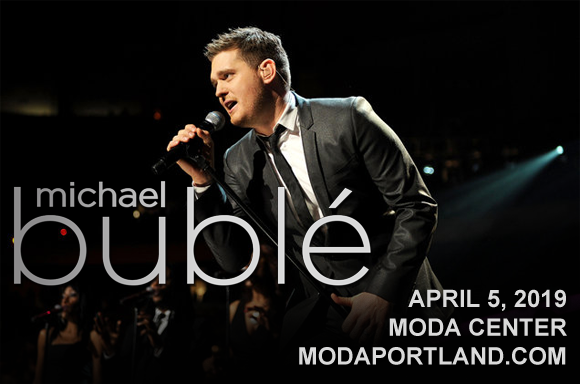 Following a two year hiatus, four-time Grammy Award-winner Michael Buble is back on the road, and he's coming to Moda Center on Friday 5th April 2019! The consummate showman delivers slick, charismatic showmanship and incredible talent with every show, and will be bringing brand new material to the stage from his latest record, Love! Michael Bublé has sold over 75 million records worldwide since the release of his self-titled studio album in 2003, and has become a highly-awarded artist, with four Grammy Awards and thirteen Juno Awards under his belt, among many others. The Canadian singer, songwriter, actor and record producer self-released three albums in the late 1990s/early 2000s, leading to a record deal with multi-Grammy Award-winning producer David Foster (Madonna, Brandy Norwood, Whitney Houston, Michael Jackson, Céline Dion, Barbra Streisand, Kenny G, Cher, Josh Groban, and Andrea Bocelli), who eventually signed him to his label, 143 Records. Buble's 2003 studio debut was an instant Top Ten hit in Canada and the UK, and proceeded three consecutive US number one albums, which brought the singer even greater fame. To date, Buble has recorded eight studio albums, including his most recent release, Love (2018).